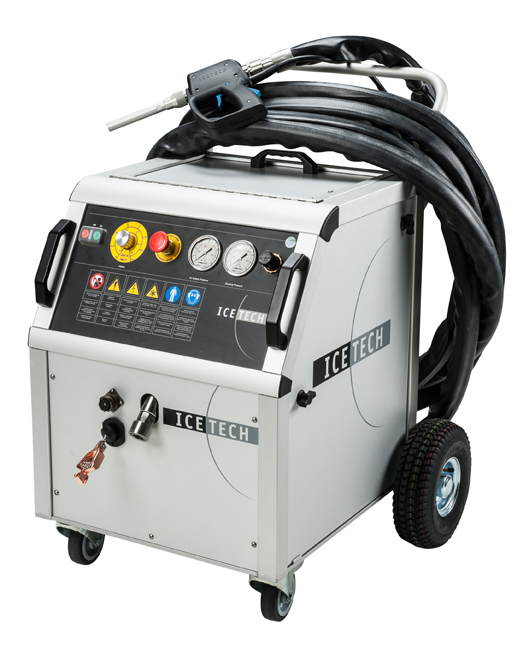 The IceBlast KG30 Supreme is a versatile, heavy duty dry ice blasting machine. The feed rate can be as low as 1.1 pound per minute and tops out at approximately 3.6 pounds per minute, depending on the job. Blasting can be done as low as 29 psi for delicate applications or up to 232 psi for the very difficult applications. When combined with the IT3 nozzle kit, the IceBlast KG30 Supreme becomes multi-functional. The IT3 kit comes with a 'splitter' which breaks the blasting dry ice pellet into smaller, granular pieces which allows for a more effective clean. This technology also results in much less dry ice consumption than the competition for the same or better clean for a return on investment that cannot be beat. Reduced dry ice consumption is where IceTech truly differentiates itself from its competitors.